Mason jars can be used as drinking glasses (glue a glass candle stick to the bottom and you’ve got yourself a redneck wine glass). You can use them as storage for beans, rice, or any kind of dry good. You can use them as a way to give homemade gifts, ie: hot cocoa mix, cookie mix, bath salts, bath bombs, pretty much anything you can fit inside of the jar. You can use them as bud vases for flowers or to keep herbs fresh longer. Heck, you can even use them as a lunch container. If you used your mason jars for canning purposes, you can reuse them and the canning band over and over again. It is advised, however, that you should not reuse the lids as they might not seal again properly. HOWEVER, there are tons of great ideas out there on ways to recreate new things with the lids. 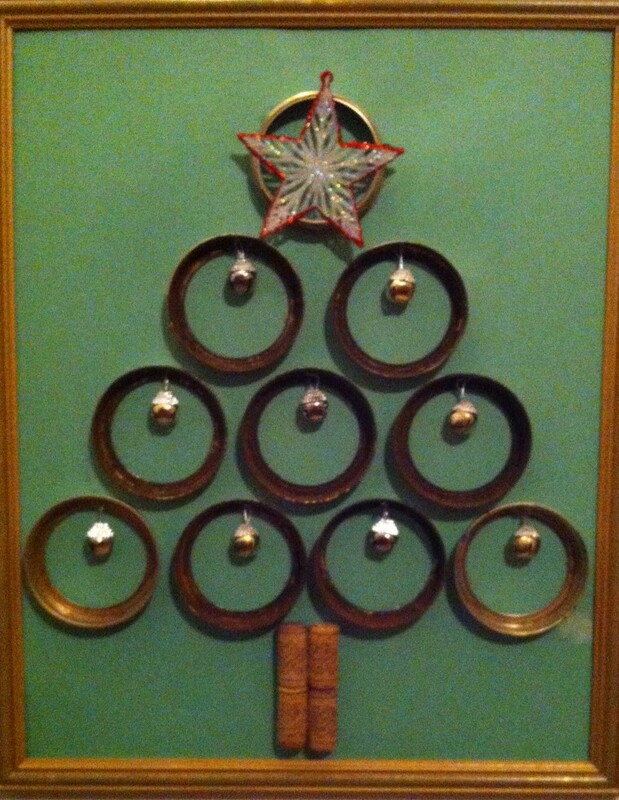 Now about the bands – I scored some old rusty mason jar bands at a thrift store last year and I used the bands in one of my 12 days of Christmas decorating challenges to make a mason jar band Christmas Tree. A few other embellishments and I had a new wall decoration for Christmas. You can also use the bands at other times of the year ie: halloween and make a pumpkin that you could display on a shelf, in the window or on your table. String them together(jute is strong and works great) and add something like rolled up fabric or cinnamon sticks as the stem. Cut a leaf from burlap or fabric to further decorate. This would look great using the old rusty bands as well. Here is an idea, I have not tried yet but I plan on doing it sometime this year. I found this picture here on a Farm Wife’s Life which will include a tutorial on how it was made. I’m looking forward to sipping lemonade on the patio this summer. 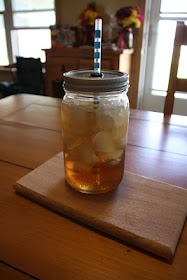 Now onto jars with lids that are not mason jars…. I try to save all my glass jars, like spaghetti sauce, jam, bbq sauce etc. In my former life I did some catering and party decorating (weddings, baby showers, birthday parties and rehearsal parties). Candy buffets were (and I think still are) quite popular but the vessels to hold candy can be quite expensive. I was always very resourceful when it came to the types of vessels I used in my displays and YES some of them were recycled jars. 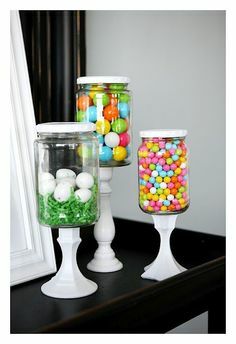 In the picture below the lids were painted white and were glued onto cheap candle holders that were also spray painted white, depending on your color scheme you could paint them whatever color you choose. When I was pressed for a deadline on a project I was working on I didn’t always take the time to document or photograph the things I made 😦 now that I have a blog I realize how important that is!!! I did make that mistake AGAIN (not photographing what I was working on) at Christmas when I was trying to finish up some gifts I was making so I could get them packaged up and mailed to the folks back home. I took two spaghetti sauce jars (washed and cleaned) and first I spray painted the lids. For each jar, I put a gift of money inside a recycled pill bottle which then was put inside a scrapbook paper covered empty toilet tissue tube. I filled up the jar with red and green candy and embellished the bottle with ribbons and a tag. My nieces advised that is was a fun and unique way to receive their gift from me this year. Here is a very similar idea I found at Happy Home Fairy. So before you throw away recycle another glass jar, ask yourself what else could it be used for – hopefully the answer will be A Wandaful Thing. This entry was posted in DIY and tagged bands, cheap, crafts, creativity, Decorate, DIY, easy, free, gift, herbs, ideas, lids, lunch, mason jar, recycle, repurpose, reuse. Bookmark the permalink.